Quick Update: I just heard from William Beutler, Senior Online Analyst with New Media Strategies. It was interesting to see how he’d predicted TIME’s pick in an October post on his blog! Smart thinking! 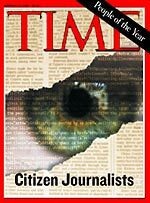 Interestingly enough, Steve Rubel had argued that “Bloggers” should be voted as Person of the Year in 2004 and HyperGene Media Blog had argued for citizen journalists!! So now back to reality, 2 years later – with YOU being voted as TIME’s Person of the YEAR 2006! Community rocks the TIME vote! The answer is, for some unbelievable reason, you and I. And that unbelievable reason, is that we see in each other a family of like-minded collaborators with whom we love sharing concepts and ideas related to a topic we all feel passionate about, and through that we foster & maintain our very own global marketing community. And for seizing the reins of the global media, for founding and framing the new digital democracy, for working for nothing and beating the pros at their own game, TIME’s Person of the Year for 2006 is YOU. And I’m so glad to be a part of this growing community of marketing collaborators and look forward to a year filled with exciting discoveries, face-to-face meetings, and hundreds of blog posts. I’d like to take this opportunity to thank Jeremiah who first evangelized blogging to me and to the marketing community who welcomed me — Mack, Ann, Eric, Karl, & David. To friends, family and community! Happy Holidays! Hiya M: You found the writeup cheesy? Actually Lev Grossman (the author) is one of my favorite columnists. And I’m so pleased with this nod from MSM as it will do much to get those naysayers to open their minds, if even partially. Happy Holidays to you, too :-). Don’t get me wrong, CK, Lev Grossman is great, second only to Joe Klein, but I’m sure he’d agree that it is a romantic notion (albeit, one that all of us subscribe to)! Yes, it’s all about You! Glad to have learnt of your blog… Will keep checking in every now & then. Keep blogging! As for me, I think the “You” still has a long way to go on a global scale. But I am glad that social media seems to be kickstarting in our SV backyard, something that I do think will have greater ramifications down the road. It looks like 2007 is going to be a top year for blogging … there is plenty to chew on coming out of 06 and there have been some spectacular social-media-boo-boos that we (should) have all learned from. Happy New Year! Thanks for the CSM link. It definitely throws some light on the romanticized version portrayed by TIME. I agree that YOU is a rather flawed premise because we still cannot answer the question “How have WE impacted the world positively?”, and also the fact that WE constitutes just a minor % further accentuates the speciousness of the argument! YOU actually stands for the bloggers such as Scoble who are really impacting the world with their blog antics and soon many more will join the bandwagon, THANKS to the exposure from mainstream media like TIME. I truly believe blogging will peak in 2007 and from then on the good ones will be separated from the rest, much like the dotcom shakeout and the soon-to-be web 2.0 shakeout. But you’re right, a lot to learn from and a LOT to look forward to.